There were 17 more polls from 12 states released on Friday to close out the work week. Now the race heads into the next to last weekend before election day with an only slightly refined outlook here at FHQ. 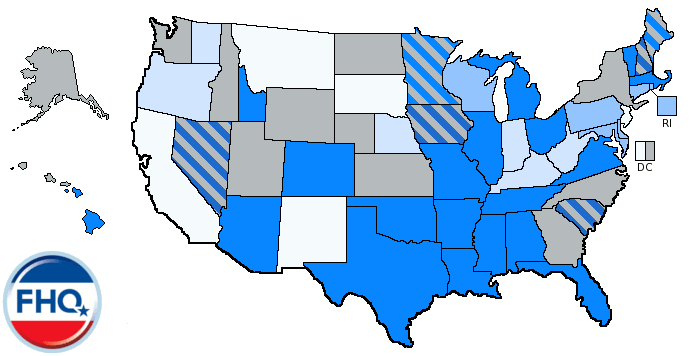 Three pollsters had multiple surveys released across a series of states and two of the three were internally consistent in terms of the established -- here at FHQ anyway -- order of states. The series of Purple Strategies polls indicated quite a tight-knit jumble from Ohio at Obama +2 to a tie in Virginia (with Colorado at Obama +1). FHQ has been saying for a while now that Colorado and Virginia were close to tied in the post-Denver polling, so that those two are flip-flopped compared to the FHQ order is a minor difference. The order is right on in the Rasmussen polling with Wisconsin tied on the left (Obama) end of the distribution and Arizona off to the right end. Both the Florida poll and the Arizona poll were consistent with the FHQ weighted average margin, but the tie in Wisconsin was a bit further off. Gravis Marketing's polls were a little bit harder to swallow. Given the information we have to this point it is difficult to see Iowa (Obama +4) and North Carolina (Romney +8) being as far apart as they are in terms of absolute distance. Nevada being closer than Iowa is also noteworthy but not necessarily out of the ordinary. However, the North Carolina result seems to off the mark (though in line with the firm's previous poll in the state) compared to other recent polling outside of the last couple of Rasmussen polls there. Rasmussen was in the field in the Grand Canyon state a month ago and things have barely changed. The president has ticked up a couple of points and Romney has held steady in a state that has been rather firmly lodged in the Lean Romney category all cycle. 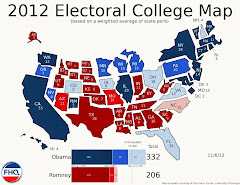 ...despite talk of Arizona being a swing state during 2011. Back in September, Purple Strategies showed Obama up by three. That lead is now down to one point based on a zero-sum exchange of a point between Romney and the president. I'm not going to say that either FHQ or Purple Strategies is correct, but this poll is a mirror image of the weighted average shares for both candidates. Colorado is close but just ever so slightly tips toward Obama right now. But let's not overstate that advantage. Down-the-stretch volatility could easily push Colorado toward Romney on election day. The polling was quite favorable to Governor Romney in Florida today. The Sunshine State News poll -- at Romney +5 -- is perhaps outside of where most of the polling has been in the state following the first debate. However, the poll is more a bookend on the range of polls there than an outlier. Florida continues to stubbornly stick in the Toss Up Obama category, but as is the case with Colorado above, to call the state anything other than a tie (that may be slightly more favorable to Romney than the averages here indicate) is pushing the envelope. The Gravis poll of Iowa seems fine on its surface. It is the firm's first poll in the Hawkeye state and is within range of the FHQ averages (both margin and individual candidate shares of support). Yet, Gravis now joins Marist and YouGov as the only firms since the first debate to show the race in Iowa outside of one or two points in either direction. Unlike in Iowa, where it nailed the Romney share of support relative to the FHQ weighted average, the Gravis survey of Nevada, was right on the Obama share of support -- right at 50% -- and was further off on the Romney share of support. Again, as we described yesterday, Nevada seems to be in a position where the president is hovering above that threshold and Romney is in need of not only catching up but of bringing Obama down some. The catching up seems to be happening, but the bringing down does not. Both candidates, for instance, gained a point each since the last Gravis poll in the Silver state. That said, Nevada did ease over into the Toss Up Obama category after clinging to the line on the opposite end of the line between the Lean and Toss Up categories. +/-3 seems like the range in the Granite state at the moment. Sure, there are some polls with margins beyond that range, but they are the exceptions post-Denver. 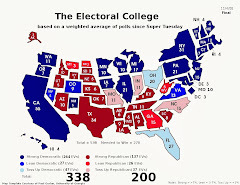 This New England College poll meets that criterion. The leads since the first debate have split evenly between the two candidates and the median poll margin value is zero. It is tight in New Hampshire and the averages here at FHQ are playing catch up. New York, New York. It is still blue and the Siena poll is hovering right around the weighted average margin FHQ finds in the Empire state. 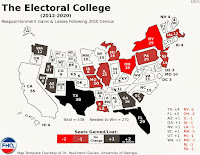 As was mentioned at the outset of this post, the Gravis poll is a bit of an outlier compared to most over polls in the Tarheel state of late. That said, the poll is in line with the firm's previous post-Denver poll. Most polls, however, show a much closer race, but one that continues to favor the former Massachusetts governor. Again, North Carolina is the one toss up state that has been tipped toward Romney all along, and there really is little evidence to the contrary in the polls that continue to come out of the state. The one factor that is seemingly relevant in the Buckeye state is that the president's leads have contracted some, but continue to be in his direction. Romney simply has not been able to get over the hump in Ohio and that is true across the three polls in the table above. It is a modest advantage, mind you, but it is a persistent lead for the president. Is there really all that much to say about another poll showing Romney crushing the president in the Sooner state? No, not really. Oklahoma is very comfortably red -- one of the few states that did not swing toward the Democrats and Obama in 2008. Instead of trading leads in the surveys released from Virginia today, the two candidates settled on ties in the two newly added polls. As FHQ has mentioned, that has had the effect of bringing the average down, but very gradually. Both polls indicate a steady share for Obama and show a slight growth for Romney since the last polls conducted in the state. In the Badger state, Rasmussen polling has stayed very close between the two candidates and lingers in the 49-49 area poll after poll. That differs slightly from the 3-4 point leads most other firms have fairly consistently found in Wisconsin in the time since the first debate. The clearest indication about the feelings in the campaigns about the Badger state is how much spending is taking place there and how many visits are being made there compared to other toss up states. Other than that, Obama is at or above 50% in a great many Wisconsin polls; putting the state in the same boat with Nevada. There was very little change on the map or below on the Spectrum. Consequentially, Nevada slips over into the Toss Up Obama category, but only jus barely. Still, a toss up is a toss up, and Nevada has closed enough now that it is and should be considered as such. At the same time, the leads for Obama there have been consistent and modest. From the Romney perspective, that is attainable, but difficult in the waning days of the campaign. Shifting to the Watch List, there was again very little change. Nevada moved from one end of the Lean/Toss Up line to the other, but the take home is that it is positioned more closely to that line than the partisan line separating both candidates' shares of states.